The Gowanus Lounge: GL Analysis: City Shows Its Hand in Coney, Now What? GL Analysis: City Shows Its Hand in Coney, Now What? Several thoughts come to mind in terms of yesterday's major announcements regarding Coney Island's future. The zoning changes, and the city's decision to acquire land in the amusement district--engaging in a lucrative land swap with developer Joe Sitt--is the culmination of more than two years of public arguments and closed door negotiations. It would appear to be the city's way of (a). throwing in the towel with Mr. Sitt and looking for a fresh start in Coney's core and (b). creating another big city-driven development plan that will be a lot more like Hudson Yards in terms of process and spirit than Mr. Sitt's buy-up-the-land and demand zoning changes strategy. It is hard to feel sorry for Mr. Sitt in that his approach to the Coney Island project was about as inept as one can find in terms of managing to alienate just about everyone, including people like Mr. Doctoroff who had the power--and, apparently, the desire--to cut him out of this particular slice of the action. It is also likely that Mr. Sitt will profit handsomely at taxpayer expense. Mayor Bloomberg said as much at the end of his press conference when he noted that Mr. Sitt had bought the property and that the system allowed him to make money. Mr. Sitt will make money on the deal and develop housing and retail on a site that the city will rezone for that purpose. The word has already gone out that it will cost "hundreds of millions" to buy property that Mr. Sitt probably purchased for about $120 million. In terms of the amusement district itself, it is heartening to see the city take steps to create zoning that will protect it as such. There is less joy to be found in the plan to turn over a huge chunk of land to a single, large operator. Yesterday, Mayor Bloomberg said that "Today, you can't have a bunch of little things and have them survive" and there were many references to finding a "world-class" operator. One can almost see the Mouse Ears appearing on the horizon. Without question, the city has greatly extended the timetable on redevelopment, probably far beyond Mr. Bloomberg's term in office and even past his successor's. The Mayor said that he hoped to see the start of some development by the end of his term in office, and timetables of 10-20 years seemed to be used. It is a strong contrast to Mr. Sitt's timetable. He started demolishing things last winter and has been boarding up property he owns and kept demolition equipment parked on his property. While the renderings that the city released yesterday are interesting, they are likely to be no more valid than the long series of renderings that Mr. Sitt released from time to time--fascinating to look at, but that's about it. There will now be a long and necessary public discussion period and a potentially long process of cutting deals with the owners of privately-owned land. The public issue concerning Mr. Sitt will likely be the amount of money he is paid. The issue with other owners--such as the engimatic Horace Bullard--could be intransigence. We wouldn't be stunned if the city ends up in court and if eminent domain is used. Nor would we be shocked to see the next mayor change course if the project is still bogged down. Frankly, we wouldn't be surprised if today's five-year-old will be of legal age before the first ride is ever taken in a new Coney park. In the meantime, it's now up to the city to ensure that Coney Island remains a vital place and that steps are taken to use land that is now sitting empty thanks to Mr. Sitt's premature demolitions. 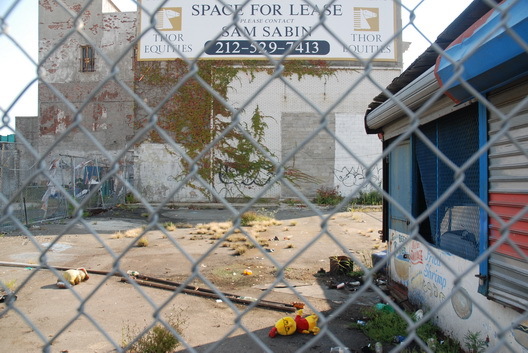 Far from being over, the Coney Island redevelopment saga is only starting. another chapter in the continuing history of land grabs at Coney. we'll be lucky if our grandkids get to ride the rides in the new Coney. Thanks for your excellent coverage of the saga. I always look forward to your analysis of Coney development- simply the best! Great article...I know this is a big issue, but usually don't bother reading into it, your insight is very interesting. Fabulous analysis, as usual. This is a mixed blessing but I for one am glad to see Joe Sitt go. I'm just sorry the taxpayers have to foot the bill, as it were. I would hope that those who have advocated for the responsible redevelopment of the neighborhood will continue to make their voices heard throughout the process, even if it does drag on for years to come.